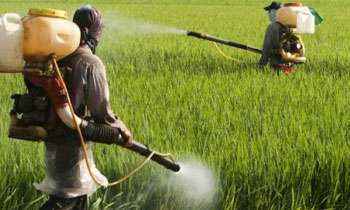 The Government has lifted the ban on glyphosate for all crops throughout the country by a gazette issued by the Registrar of Pesticides. In a gazette notification dated July 11, 2018, Registrar J.A. 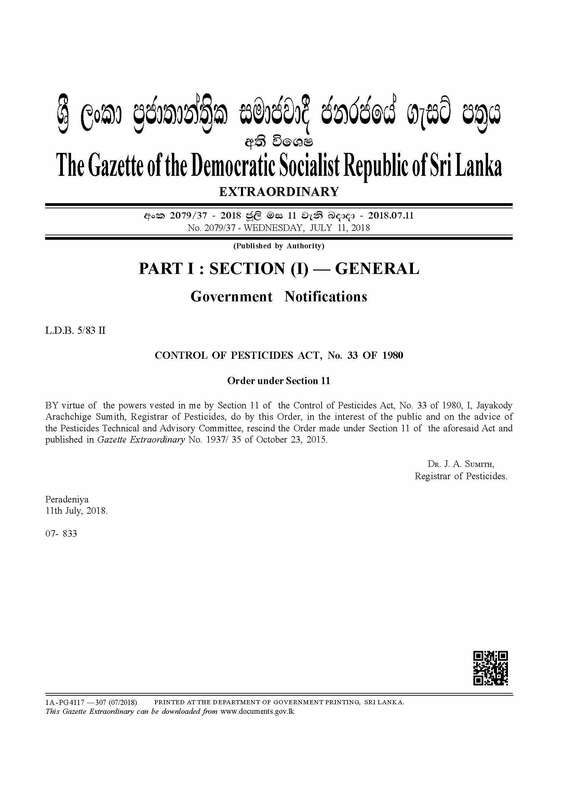 Sumith said that on the advice of the Pesticides Technical and Advisory Committee, he was rescinding the order made under Section 11 of the Control of Pesticides Act No.33 of 1980 and published in Gazette Extraordinary No. 1937/ 35 of October 23, 2015. The 2015 gazette cancelled every licence issued in respect of pesticides containing the chemical glyphosate. A bad decision. Here again profit is classified higher than the health of the people. There are not even regulations that the workers who spray the poison have to wear protective clothing and masks with filters. Ok like everything else with this government u turns everywhere! Are they running Sri Lanka thinking it is a wayside grocery? MS has just seen the news in the papers. Who knows, he might overturn the decision tonight. He loves that ?? Let's die together after thanking the government for poisoning us. This particular pesticide producer has bribed some one to get the banning order rescinded. There is no difference between this government and the previous, both are corrupt to the core.That is why this government is scared to prosecute MR and his gang. a great win for science. UK/US/Eu Glyphosate is not banned. There is no scientific evidence to say glyphosate is responsible for kidney disease. Glyphosate is banned in most advanced countries as it causes health risks for those applying the chemical, as well as poisoning the the pruduct and soil. Monsanto are only interested in profit. Good decision . On Tea and Rubber Plantations Glyposate /Roundup is sprayed if there is Illuk or Cooch Grass only.Spraying is done only on these patches and not all over. This shows the inability of the Government to find solution for weed control rather depending on Glyphosate. This contains active groups charged negatively, which attract metal ions making the compound stable and extending its half-life from days to years. Where is Rathana thera who made this an election issue? This is the right decision. Glyphosate is not banned in most advanced countries. It is a pesticide that breaks down quickly outdoors. The replacement pesticides that will be used in the absence of glyphosate are way more toxic. So until the science proves that there is is a direct cause and effect relationship to roundup, just stay with this decision. Remember however that glyphosate is a pesticide and therefore it is has to be used carefully (gloves, boots, masks, etc) and follow the label directions. I am pretty certain this fellow is some way a beneficiary to the government’s decision to allow this dangerous pesticide.He may be a local agent to the company that produces or sells this toxic stuff. As a result we have already stopped drinking tea ..!